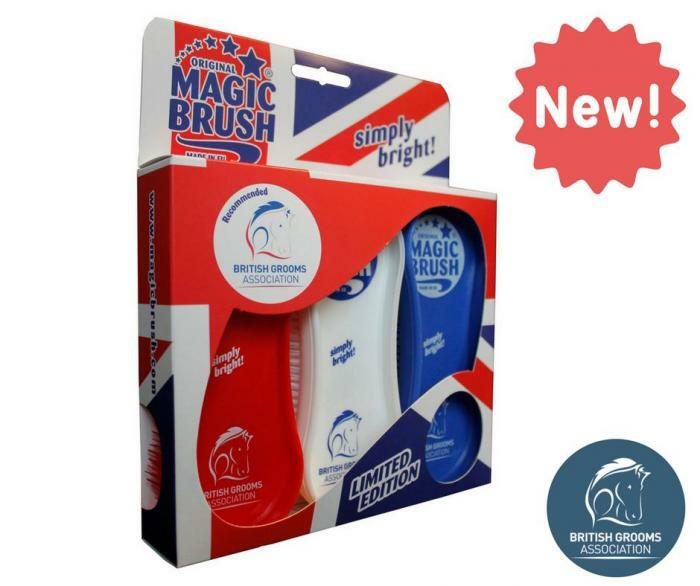 The BGA has teamed up with leading brush manufacturer MagicBrush to launch the limited edition branded BGA MagicBrush Set. Known for their brilliant mud busting properties the brushes also remove loose hair effortlessly, massage the horse, offer a deep clean and are great for cleaning numnahs and saddle pads. BGA member Hannah Smith said, “We have been using the MagicBrush on a yard of seven horses all winter and I have to say we have saved so much time removing mud. It used to take forever to get rid of the caked-on mud but now it is so much quicker and easier. The brushes have withstood this and when they get full of mud we just run them under the tap and they look like new. This is a must for every grooming kit. Eva-Marina Böhm, founder of MagicBrush and a passionate equestrian herself, is very pleased about the cooperation with the BGA. Horse care and grooming issues are an important topic to her and her company MagicBrush. “The aim of our company is to make horse and rider shine with highest quality”, stated Eva-Marina Böhm. To get your BGA MagicBrush Set click here.